If you search your ancestors in Lappano, Calabria, info about your Italian family are stored in the City Office archives or at the parishes. In towns and villages of Calabria and in Cosenza province registry offices were established in early 1800: it means that you could find information in Lappano registrar as of that date. So, if your ancestors were in Lappano in the nineteenth or twentieth century, then you could try to contact the City Office of Lappano to know more. 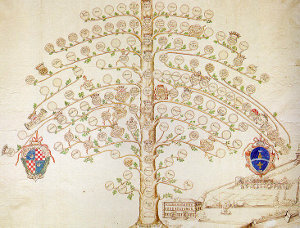 Before to start your genealogy research in Lappano, we suggest you to read our tips for your search . They are useful to search in Calabria and in Lappano too. 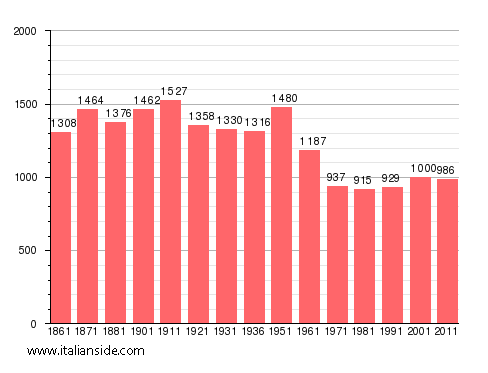 Next picture shows the demographic trends in Lappano from the Italian Unification (1861) an important info to understand how many people lived there in the past. It could be important to know if the last name you are investigating is a frequent surname in Lappano. As more your surname is common in Lappano, as more it could be difficult to find the right info about your ancestors in Lappano archives if you have not exact dates. Aiello, Barone, Bruno, Caputo, Caruso, Chiappetta, De Luca, De Marco, De Rose, Esposito, Falcone, Ferraro, Filice, Fusaro, Gabriele, Gagliardi, Gallo, Garofalo, Gaudio, Gencarelli, Gentile, Giordano, Greco, Guido, Leone, Longo, Madeo, Marino, Martino, Mazzei, Morrone, Nicoletti, Nigro, Palermo, Perri, Perrone, Porco, Presta, Pugliese, Rizzo, Romano, Ruffolo, Russo, Salerno, Santoro, Spadafora, Sposato, Veltri. Church archives in Cosenza province may instead contain even older information, but they are far less accessible from abroad (and almost impossible by email). If you have the opportunity to visit Lappano and Cosenza province, you could plan to investigate churches’ archives by yourself, but from abroad is very difficult to obtain any result unless you find a reliable local help. If your research is in a dead end and you need professional help from our local Italian genealogists write to lappano@italianside.com our expert in Lappano area will study your request and will reply to you with a research plan and a quote. *Father was Pasquale Covelli(with an “i”, not an “o”), mother Maria (no maiden name found). *. Immigrated to NYC in 1985. We would like to know if there are any relatives out there. Covello is not a common name in the US, so there aren’t a lot of us around. He had 1 brother born in Lappano Michele Gerbasi January 30, 1914 and he died in Lappano March 30, 1920. An older brother Francesco Eugenio Gerbasi was born in Aprigliano August 1914. My grandparents were Salvatore Gerbasi and Giuditta Pucci. I would greatly appreciate any information you could provide or suggestions of where I might find more information. My grandfather Giuseppe Pasquelle Caravetta was born in Lappano on August 27, 1880. His parents may have been Antonio Caravetta and Theresa Bruno. He departed from Naples April 1910 on the S.S. Louisiana and arrived in NYC on May 2, 1910. Several of his siblings also immigrated to US but not all. If you have any information regarding Giuseppe Pasquelle Caravetta, it would be much appreciated. My grandfather Giuseppe P. Caravetta was born in Lappano on August 27, 1880. He departed from Naples and arrived on Ellis Island on May 2, 1910. I believe he had a sister named Ida. This is all I know. Any information you may have on my grandfather would be greatly appreciated. Thank you for your assistance. Looking to find info on my grandfather Salvatore Gervino. From Lappano, born in the late 1880’s. Believe his mother died when he was a baby. His father brought him to Chicago in the early 1890s. He had an uncle in Chicago that his father left him with. His father returned to Italy. I believe he had a sister bUT this is about all the info I have. Anybody familiar with this family? Thank you! My great great grandfather’s name is Michele Gervino, born right around 1865. He was from Lappano and had 5 children when he left from Naples to Ellis Island in 1900 at age 35. He then had 5 more children in the U.S., the first of which was my great grandfather. They grew up around the Pittsburgh area. We still don’t know why our last name changed from Gervino to Ross (which is signed on his death certificate). The population was so small in the town and the timing is right, my grandfather told me we already had family over before Michele came over in 1900. Could we somehow be on the same search?? We might be. I just found my grandpa’s birth certificate today. Looks like his father had a sibling named Michele. Let me do a little more digging.! Oh yeah his name was actually Serafino Gervino. His father turns out was Salvatore. I would love to find my lineage and present relatives now in Lappano and Cosenza Italy. My father was borh in Lappano on Sept. 19, 1907. His parents name were Anmunziato Intrieri and Saveria Scarpelli. He emigrated to the US in March of 1923 along with his father.He told us before he died in 1967 that he had a step-sister in Lappano but we have no other information. I would like to find out if I still have some family in the Lappano area. My great grandmother was from Lappano and her name was Maria Scarpelli, my great grandfather was Frank Scarpelli, they both had the same last name before marrying. Also my Grandmother was born there Elissa Scarpelli and her brother was Anthony Scarpelli. In addition my Grandfather was Joseph Grano, with siblings Romano, Edwardo and about 10 others I dont know. Any of this match what you have? Would love to put together all the peices. My grandparents were from Lappano Italy – Michael Covelli and Antoinette Sproveri. My great grandparents last name was DeMarco. I would love to be able to locate some relatives from the area and connect with them. Mario.I believe my grandmothers maiden Name was DeMarco. Researching Michael and Louisa Filicetti from Lappano that immigrated to the US in 1905. I know they departed from Naples and arrived Ellis Island. Michaels Date of birth is November 8, 1885. If you could help me get started on finding this lineage, marriage certificate, baptism ect… Would be appreciated. If you would like to start a research in Lappano please send your request to lappano@italianside.com.